"The Falkland Islands have a bright future, not without challenges, or harassment or bullying, but the Islanders will face them with the same strength, tenacity and resolve that helped them through the conflict 33 years ago” said the Rt Hon Hugo Swire MP, Minister of State at the Foreign and Commonwealth Office Foreign Office during his address to those present at the at the annual Falkland Islands Government Reception in London. He had been introduced by the Hon Jan Cheek MLA, visiting Legislative Assembly Member of the Falkland Islands government. The reception was attended by UK officials, Members of Parliament, diplomats, Falkland Islands officials, friends and supporters of the Falklands. The event is held annually event during which the Falkland Islands government celebrates and thanks all those who support the Islands right to self determination, to chose its future and develop its resources. "I believe the future of the Islands is a bright one. But of course, a community's future is built on its past. Sadly for the community - three decades on, and despite being clear beyond any doubt of their wish to remain a UK overseas territory - Argentina continues its programme of bullying and harassment. But, unfortunately for the Argentine government, the same Falklands' spirit that existed in 1982 exists today. Bullying will result only in a more determined, more defiant community. And let me be clear: the British Government unequivocally supports the Islanders' right to self-determination and their right to develop their economy". 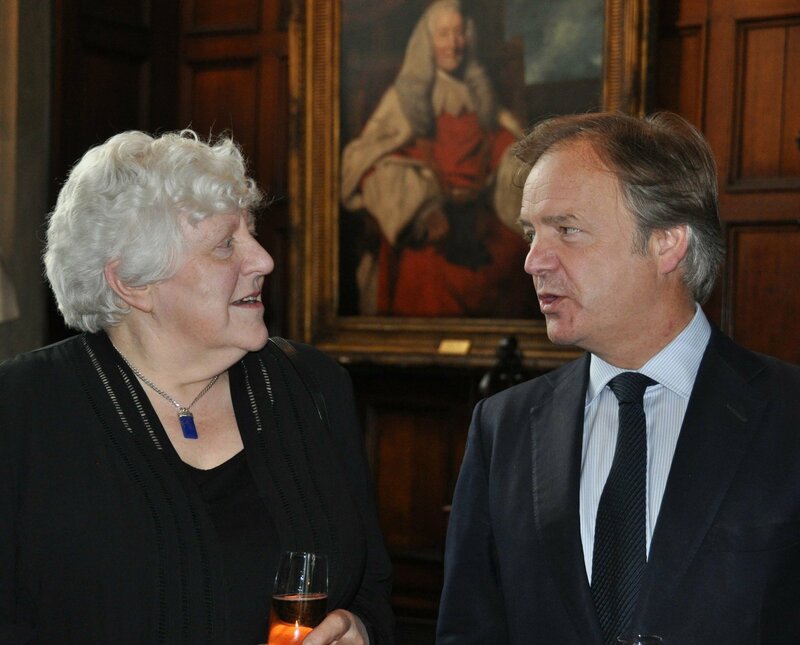 "I am delighted to join you again at this wonderful annual event - celebrating the Falkland Islands. It is a pleasure to see Legislative Assembly Member Jan Cheek here this evening. I am grateful to Jan and the Falkland Islands Government for inviting me to say a few words. I would also like to thank Sukey Cameron for organising this event - and for her tireless promotion of the Falkland Islands. As I will say over the next few minutes, I believe the future of the Islands is a bright one. But of course, a community's future is built on its past. And many of you here attended the commemorations in London in December, marking the centenaries of the Battles of Coronel and the Falklands – and descendants of the Commanders of both the British and German ships joined Islanders in a moving ceremony in Stanley - to remember those who lost their lives in the first naval battles of the First World War. We also continue to honour the sacrifice made by the 255 British Servicemen and their families - and the 3 Falkland Islanders that lost their lives in 1982. And, of course, we also remember those young Argentine soldiers who died. In his Christmas message, Prime Minister David Cameron referred to the award of the South Atlantic Medal - in recognition of the Islanders who assisted the British Forces in liberating the Falkland Islands and on Sunday, the Chair of the Legislative Assembly, Ian Hansen, received that medal on behalf of the Islanders. They will rightly feel a great sense of pride. But sadly for the community - three decades on and despite being clear beyond any doubt of their wish to remain a UK overseas territory - Argentina continues its programme of bullying and harassment. The hydrocarbons industry in Falklands' waters - a legitimate commercial venture - is the target of despicable attempts to strangle the Islanders' livelihoods. Unfortunately for the Argentine government the same Falklands spirit that existed in 1982 exists today. Bullying will result only in a more determined, more defiant community. And let me be clear. The British Government unequivocally supports the Islanders' right to self-determination and their right to develop their economy. While we have always extended the hand of friendship to Argentina as responsible fellow members of the G20 - we will never shirk from defending the rights of the people of the Falkland Islands to enjoy a safe and sustainable future. And despite Buenos Aires' best efforts, there is much cause for optimism. At this event last year, I said how delighted I was to have visited the Islands - and seen first-hand the ambition and drive of your wonderful community. Progress has continued apace over the last twelve months. 44,000 tourists visited the Islands with nearly 100 cruise ships calling in. The fishing industry has enjoyed another record year, landing over 353,000 tons of Ilex squid – testament to its efforts to conserve and manage fish stocks. The fourth phase of de-mining operations commenced in January - and by the end of the year, we intend to have fully cleared 25 minefields - including Eliza Cove. And of course the 'Zebedee' and 'Isobel Deep' wells have been declared as oil discoveries. Whilst there is still some way to go, other recent announcements point to a very positive future for the Falklands' hydrocarbons industry - and indeed, for the Falklands' economy as a whole. I am also glad to see awareness of the Islands increasing. I saw the new BBC hit series "An Island Parish”, which brought the realities of day-to-day Falklands life into British homes in a way not seen before. It showcased just how much the Islands have to offer: beauty; diversity; potential; and community spirit. This progress has reaffirmed to me that the Falkland Islands have a bright future. There will be challenges - but I know the Islanders will face them with the same strength, tenacity and resolve that helped them through the conflict 33 years ago”. 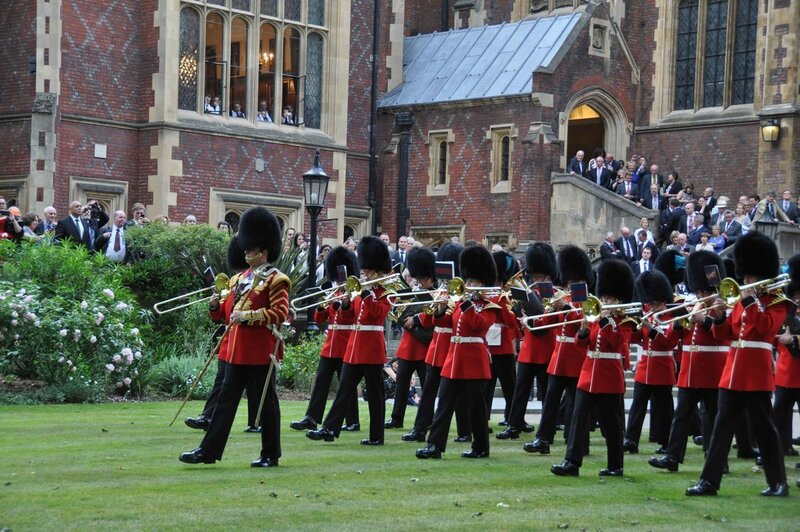 At the end of the evening the band of the Irish Guards "Beat Retreat” and Mark Lancaster MP, the Minister for Defence Personnel and Veterans, a Lieutenant-Colonel in the Army Reserves, took the salute accompanied by MLA Jan Cheek.